Mmmmm. Mold Bars. Doesn’t the name simply make your mouth water? In a large microwave-safe bowl, melt margarine and marshmallows. This will take two or three minutes. Stir until smooth. Add food coloring to the marshmallow mixture. Blue, green, and red make an unappetizing mixture. Experiment to see what you like, either blending in each color thoroughly or not. You may need to reheat the marshmallow mixture in order to stir it. Add puffed rice cereal. Stir until well coated. Press mixture evenly into a buttered 9 x 13″ pan. (Or whatever size pan you have around. It isn’t like the recipe police are going to check on you.) Cool. Cut into squares. So how did this recipe come about? Let’s take a trip back in time. Back in the early eighties, I was an acne-studded calculator-sporting member of the National Honor Society at a high school in a dullish town in East Texas. It was Christmas time, which in my family was always accompanied by high-spirited rituals like the first winter freeze of the septic line. It was also, according to the mentally constipated NHS chapter advisors (who masqueraded as school librarians in their spare time), time for the Annual Charitable Activity. In previous years, the Annual Charitable Activity had consisted of holding a grim little cake and punch get-together for children living at the local orphanage. This year, we were informed, was going to be different. This year the orphanage had decided to limit the children’s sugar intake. How ridiculous and ungrateful of them! So instead of the orphanage, we were heading off to the local university to host a party for the underprivileged little kids who were stuck in daycare while their parents attended or taught college. Each of us was to bring two dozen homemade cookies to school Friday morning – no store-bought cookies, no exceptions! This constituted a major teenage crisis for me. At that time my family and I were building a house and living in it at the same time. There was no oven, only a microwave and a single-burner hot plate. Furthermore, we lived miles outside of town away from friends or other people I could borrow an oven from. I didn’t have access to a car, and my stepmother had her hands full with two diaper-aged kids and really didn’t have the time to fool with stuff like this. I moped and fretted all the way home on the school bus, then moped and fretted my way around the house. What was I going to do? My stepmother looked up from a soiled diaper long enough to suggest making Rice Krispies Treats®, which didn’t require an oven. Of course! Brilliant! Thursday night I wandered off to the bare plywood and sheetrock box we optimistically called a kitchen and assembled my ingredients. I even began to feel festive, it being Christmas time and all. Hey, how about adding a little touch of Christmas to the squares to make them extra special? 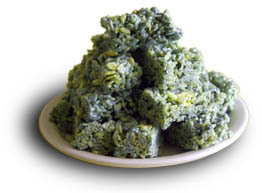 A dollop of green food coloring would make them a lovely Christmas tree green! Only it didn’t because the green cap was on the blue bottle. I frantically grabbed at the other colors, dumping them into the melted marshmallows to disguise the awful blue mess I’d created. And I succeeded beyond my wildest dreams. Green and a touch of red transformed it into an awful grey-green mess, a color reminiscent of the most exquisite molds or the pond algae one finds feasting on partially submerged summer cow pies. This moment truly defined the term “sinking heart”, but there was no way but forward – too late to go into town for more supplies, and I had no way to get there even if it hadn’t been. And I had to bring cookies to school; the advisors would check. On Friday morning I dumped my anonymous foil-wrapped bundle on a table loaded with lovingly decorated homemade cookies and ran like hell. The school’s head baton twirler, an overly hormonal mincing type who I both detested and envied, peeled back the foil and recoiled like she’d been slapped. A cheerleader came to look. “Eeeeeew!”, she squealed. They hastily put the foil back and shoved the squares under a convenient pile of debris. “Were you able to bring some cookies?” one of the advisors asked a while later. “Oh, yes,” I replied. After the party, when no one was looking, I retrieved my untouched mold-colored Rice Krispies Treats® and tucked them in my backpack. I devoured them that night in the privacy of my room. They were delicious.